Our innovative modular shelving system is created to stand unaided in the centre of your space, or against a wall. Mondular is a bookcase, display case, TV unit and much more. When we designed Mondular our goal was to create a totally flexible shelving system which can be personalised with an almost infinite number of different layouts, with a modular system forming the base of our design. Mondular exemplifies great design. We created a unit with the ability to store things in bespoke style, with minimal footprint and maximum flexibility. Mondular’s design embodies our philosophy, combining bold, unique looks with hard-wearing, practical materials. The totally seamless design of Mondular combines sleek profiles with solid construction to produce a totally new form of modular shelving system. Using invisible internal screws installed with magnetic screwdrivers, we achieve an incredible flawless finish with a slim uninterrupted profile. Our modular shelving system also allows for cables and wires to be hidden away ensuring the seamless profile is preserved. 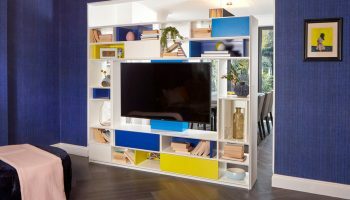 Great furniture perfectly reflects its owner, our fully customisable modular shelving system is designed entirely around your requirements. Mondular creates a totally bespoke statement, in any choice of colour palette and with any combination of units, in any finish. 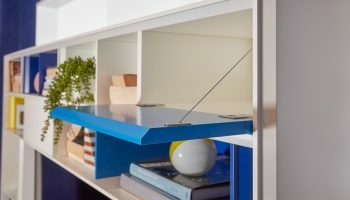 Whether you want to create a bookcase-TV stand combo or a unique storage system, our team will help you through the design process with the same contact for the whole project. As well as our standard panels, feature panels can be chosen in all our finishes including Oak, Ash, Reclaimed Wood, Zinc and Copper. 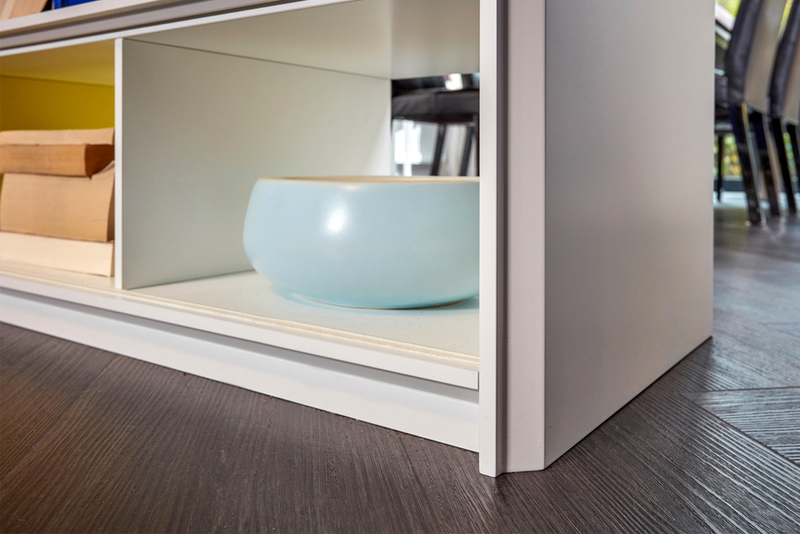 All doors fitted on the shelving unit feature subtle soft close hinges and we also offer a range of lighting and cable options to suit your needs. Our experienced craftsmen create each unique shelving unit by hand, to guarantee durability and quality. Our furniture is built to last. As well as stunningly spanning any wall, the beauty of our Mondular system is its ability to be completely free standing. This means no unsightly ceiling cables from your bookcase-TV stand combo, or ties to other structures. When we say “truly free standing,” we mean it. This also means that stability isn’t compromised. We are proud to present a modular system which pairs slim profiles with a strong structure and a truly free standing shelving system allowing it to divide your space or between your rooms, whilst allowing light and air to pass through its slim profiles, maintaining the feeling of space in both rooms. Thanks to careful design Mondular is equally stunning from both sides, truly free standing and incredibly stable. 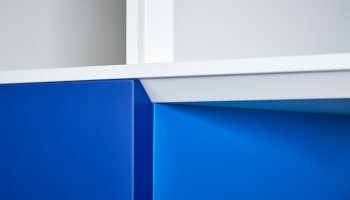 We provide an initial measurement plan of your design and once your order is placed, we work with you on your customisation options, selecting your size, design, colours and finishes as well as incorporating any of your own special requirements. Once the final design plan is confirmed we get to work creating your new modular shelving unit. Mondular utilises our unique floor anchoring system should you wish for it to be truly free standing within your space. We offer two installation options for this, either we supply the initial floor plinth pieces for anchoring to your floor by your own tradesmen or we can do this for you when we carry out the installation. When your Mondular is finished and ready for delivery and installation our specialist team will arrange with you a delivery date and deliver the unit to you. We will then install your bespoke system into the space and ensure everything is supplied to the exact standards expected by our customers.